King's Quest makes a Triumphant Return! (Finally.) — GamingWithSwag.com - Dads By Day, Gamers By Night. 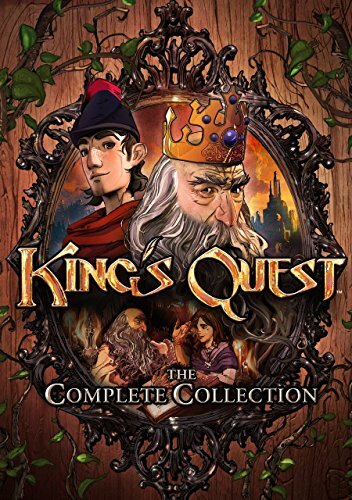 In the 80's and 90's, if someone to ask you what the best adventure game was for PC, there was a very good chance that they would respond with King's Quest as the answer. It seemed as though Sierra could do no wrong with adventure titles during this time, pushing out sequel after sequel, but still retaining the quality that Sierra promised. Over time, Activision purchased Sierra, and the PC market started changing. King's Quest was sadly forgotten, with the exception of fan remakes and home-brewed versions of existing KQ games. Today I am happy to report that King's Quest is scheduled to make a triumphed return in an entirely new format coming later this July. Using the Telltale Games method of releasing adventure games in chapters, Sierra is treating fans to another adventure of King Graham and his family. Explore the kingdom of Daventry, while solving puzzles and navigating through perils! Luckily, there is a $10 discount if you buy all five chapters in the complete collection below. I am very excited for this title, and I hope its success will bring future modernizations of Sierra classics like Police Quest and Space Quest. Jul 13 Lego Dimensions - A new collecting addiction?